In any sport, wet conditions of any kind can alter the way that the game is played and the way that players approach the game. Wet weather means that the player’s skills might not be executed appropriately as is the case in dry weather. In fact, it becomes quite challenging to play a sport in the rain, snow, cold or in other weather changes. Aussie football is no different. It needs a high level of concentration to deliver the football to the player’s foot. When there is rain, for example, the players have to drop the ball very close to the foot in order to make sure that contact is possible. Even while going through football training in wet conditions, it creates a challenge for players. The Mark Master training ball can withstand any type of weather. It is made to prevent it from being too slippery and making it easier for players to maneuver. When picking up the ball, the player must use the top hand to grip the ball and the lower hand to seal the grip. If the ball is hard to grip, then it could be knocked away by the opponent. Australian Football is exciting for both adults and children. Players can be seen running on the field, bouncing and kicking the ball each fifteen meters. This is very difficult during wet conditions. A couple of things can take place when the player tries to bounce the ball. The ball can bounce too high, not allowing the player to get the ball. In addition, the ball can hit a puddle of water and plop, not being able to bounce. The Mark Master training ball can withstand such scenarios. 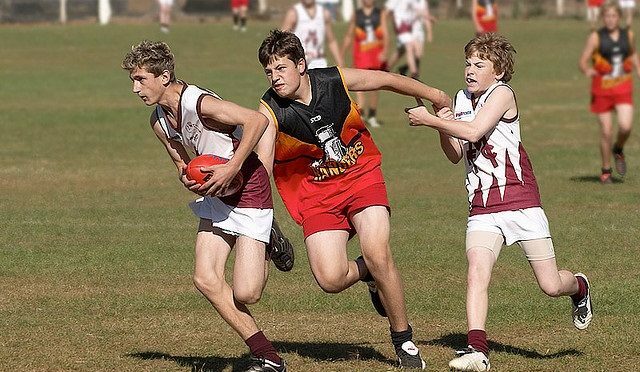 While running with this ball, the player lets the ball touch the ground so that it doesn’t slow him or her down, not allowing the opponent to catch up with you. When playing Australian Football, you have to factor in wet weather to know how to mark the ball and how to grab a slippery and wet ball. When wet, the ball will certainly get heavy and unable to be controlled. The player will be frustrated and not be able to mentally focus during the game. For that reason, the Mark Master training ball should be used to teach players how to successfully grip a wet ball and still maintain focus in the football game. No matter what conditions you are playing in, there are ways to adjust your position, your game and your mental focus. The Mark Master training ball will help you to do just that. If you are not a football player, you can get the Mark Master training ball for a friend or family member. Get it today.